McALLEN — With nearly 15 years experience inside Rio Grande Valley classrooms, Delia Ortiz said she was compelled to show support for children separated from their families at a vigil Thursday morning. Standing in front of the federal courthouse in McAllen and moments after speaking in front of a crowd of about 50 protesters and immigration advocates, Ortiz, a teacher at Kelly-Pharr Elementary in the Pharr-San Juan-Alamo school district, said it was important to her to show support for the more than 1,000 children still held inside detention centers on the day of the deadline for the Trump administration to reunify parents and children separated under the “zero tolerance” policy. A month ago, U.S. District Judge Dana Sabraw ordered the Trump administration to begin reunifying the nearly 3,000 children separated along the U.S.-Mexico border, which came after U.S. Attorney General Jeff Sessions’ April announcement about the policy’s implementation. 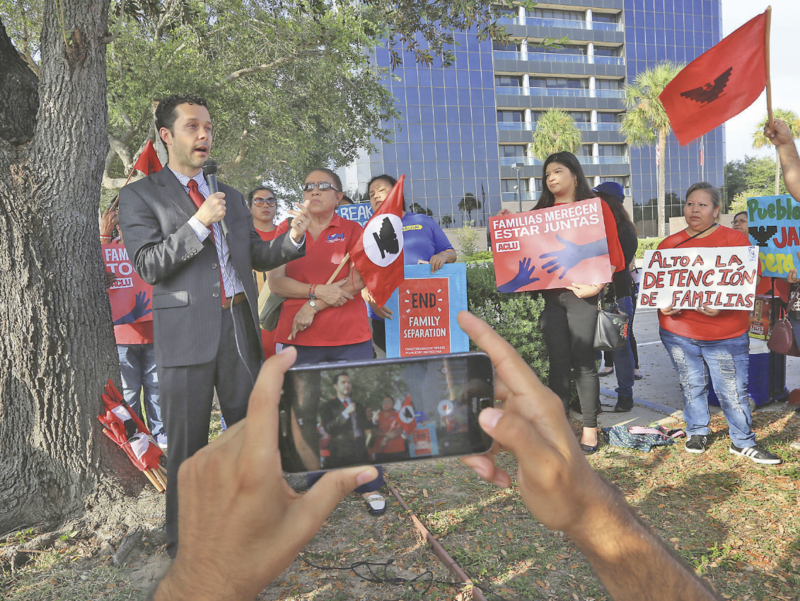 The event, marking the deadline to reunify, was held just outside the federal courthouse in McAllen and organized by La Union del Pueblo Entero, or LUPE, a local immigration advocacy group, and the Fuerza del Valle Workers Center. Ortiz was part of a contingency of childcare providers and teachers lending their voices to support the children who remain in detention facilities as the reunification orders deadline loomed. In a memo sent by Sessions to federal prosecutors along the southern U.S.-Mexico border, Sessions urged those prosecutors to employ a zero tolerance approach to illegal entry and illegal re-entry cases. This resulted in the Border Patrol referring all illegal entry and re-entry cases for prosecution at the federal level; before, only individuals with a prior criminal record had been referred for federal prosecution. As a result, people who had tried entering the country with their children were subsequently separated from them upon being referred to the federal courthouse — often without their knowledge. This then led to hundreds of parents losing contact with their children, creating chaos for public defenders attempting to locate the children for their clients. The 49-year-old educator, originally from South Bend, Indiana, who has lived in San Juan for more than two decades now, said she has witnessed what it’s like for a student to be alone, without their parents, and how it affects them throughout the school year. Also in attendance at the vigil were representatives from the Texas Civil Rights Project, which currently represents nearly 400 clients who have been separated as a result of the now defunct policy. Efrén Olivarez, TCRP’s Racial and Economic Justice Program director, said he was less than optimistic the administration would be able to meet the deadline to reunify the still more than 1,000 children in detention by the day’s end. When asked what questions he still had for the administration as it related to TCRP’s clients, Olivarez replied, “When?” the question many of the parents still detained ask about their children, when will they finally get to see their kids. The director said the administration must make every effort to reunite all families, even those more than 450 parents the administration said it deported without their children. Despite the lack of optimism from some who attended the event, Abraham Diaz, Education specialist for LUPE, said he was hoping there would be mass reunifications to meet the deadline imposed by a federal judge more than 30 days ago. By Thursday, the administration said all parents eligible for reunification would be reunified with their children by day’s end, according to a 14-page court filing. “The reunification plan outlined to the court in defendants’ filing on July 15, 2018, ECF No. 109, and discussed at the July 16, 2018 status conference, is proceeding, and is expected to result in the reunification of all class members found eligible for reunification at this time by the Court’s July 26, 2018 deadline,” the court record shows. Court records further show that of 2,511 children in the custody of Office of Refugee Resettlement, 1,820 have been discharged, and 1,442 were reunified with their parents. Advocates have reported representing clients who unknowingly waived reunification, which according to court records amounts to 120 children in such cases. The administration also proposed meeting with the representatives of the plaintiffs to discuss a host of issues, primarily “developing a plan” on how to reunite those parents who have already been deported or are no longer in contact with ORR.